Click here to search our online archive for documents and images associated with this property. The Keims are descendant from Johannes Keim who came from Lindau, Bavaria around 1698. Keim was born in Speier, Germany in 1675. Keim left Germany after the French invasion of the Palatinate (1688-1697) which ruined him. Johannes immigrated through the port of Philadelphia. After staking out his claim in the Oley Valley, Johannes returned to Germany where he married his first wife, Katarina, in 1706. Johannes had sixteen children by two wives, but only nine of the children survived past childhood. He was the first settler to stake out a claim in the Oley Valley. The Keims were among the Huguenot and Palatine refugees who fled to America from Europe. During the 1740’s, Johannes Keim was active in petitioning for the creation of roads. Johannes died in 1758 and is presumably buried with other family members in a plot on the property. The family cemetery is located across the street from the house in the middle of what is currently a farm field. Jacob Keim was the youngest son of Johannes’ first wife. Jacob, born in 1724, was married to Magdelena Hoch. In 1767, Jacob Keim was listed as a turner, owned 126 acres, 2 horses, 3 cattle, and was taxed 9 Pounds. When Jacob died in 1799, Magdalena received the right to remain in a room of the house and some other items, but the homestead was inherited by their son John. The fact that Jacob Keim ran a turner’s shop at this location means that there had to be an economic connection to the surrounding area. A turner was a craftsman who used a lathe powered by a large manually-driven wheel to shape chair and table legs, balusters, and other woodwork. However, for the majority of the site’s history, it was a family farm. In 1706, Johannes Keim returned to Pennsylvania and settled on this land, where he first lived in a log structure built in 1708. 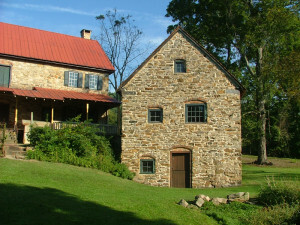 In 1753, a team of workers from outside the Valley built the house that is on the property today. Located in Pike Township, the two stone structures on this site are excellent examples of 18th century German-influenced architecture. The larger house was built for Jacob and Magdalena Keim around 1753 and was inhabited by their descendants until 1911. It is a 2 ½-story limestone structure. The building originally had a red clay tile roof, but currently is covered by a standing metal seam roof. The walk-in fireplaces and much of the woodwork and hardware are intact. The foundation and walls are made of native limestone. It is a stove-room house with facades that have a balanced look and interiors illuminated by many windows. A stove-room house has a three-room first floor plan which includes a kitchen on one side of a centrally located fireplace, and a “stove” room or family space, and a bedroom on the opposite side of this fireplace. The central stone chimney is capped by a brick section which protrudes the roof line. The original house block has segmented arches over all exterior openings. At some point, as the family grew larger, the northern block was added. There is no interior access to the addition except through the attic. There is Federal style trim in the addition. The porches were probably added in the 19th century. On the south side façade, a second-floor door originally opened onto a balcony which interrupted the pent roof line. The balcony no longer exists. The finish work in the house is for the most part original . Located adjacent to the main house is a rubble stone outbuilding, or ancillary house. This structure dates to circa 1753 and is Germanic in character as well. Apparently, this 1 ½ story structure was used as Keim’s turner’s shop. The building has a vaulted root cellar for the storage of perishable vegetables and is built into a bank. Also, there is a spring flowing through the cellar. Part of the basement was whitewashed and used for dairying. 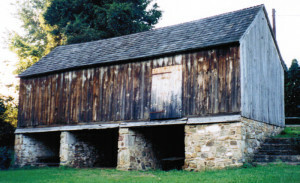 This structure is very similar to Pennsylvania German bank barns, with a working basement and a vertical link between the floors. The window and door openings have segmented arches which are similar to those on the main house. There is evidence that there originally was a partition wall that separated the kitchen from the turner’s shop on the main floor. Also, there is an aperture for a jamb stove in the kitchen. The chimney is centrally located, and the roof is covered with tiles laid on lathe boards. There is a great deal of evidence in the ancillary house showing aspects of its use as a turner’s shop by Keim. Remnants of stanchions for the pole lathe are attached to the ceiling and there are racks for chair parts. There is a depression in the floor where the foot treadle for the lathe abraded it. To the left of the lathe was a large iron door that opened into the flue of the fireplace below; workers could open the door and sweep shavings into this fireplace. Originally, there was an enclosed chamber adjoining the chimney stack used as a drying kiln for the turner’s wood (this was previously thought to be a smoke chamber). The large window in the gable end was for back-lighting the lathe, which is helpful when turning wood. The big window around the corner would have provided more light to the work area. By 1958, the structure was vacant and used as a storage space. In the 1970’s, the Hartman cider press was moved to the Keim property from the Hartman farm off Route 61, now in Muhlenberg Township, Berks County. It was placed on the foundation of a former chicken coop which had been torn down. A cider mill was used for pressing the juice from crushed or broken apples. The press itself was joined with much chamfering and some ornament. It is still in working order. The mill was dedicated at its new location on May 21, 1975. The Hartman Cider Press was placed on the National Register of Historic Places on January 1, 1988. The property also contains a small stone barn. The barn housed livestock in the basement level and the area above was used for storage. 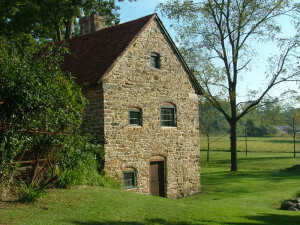 Also located on the property is a small root cellar which dates to around 1750. It is stone vaulted and covered with sod; the structure reflects the property’s Germanic influence. None of the buildings on the property has any modern amenities whatsoever. Johannes Keim’s son Jacob married Magdalena Hoch, whose father conveyed this land to the couple in 1753. Jacob would eventually add thirty acres to the family farm. By 1775, Jacob had 197 acres and two homesteads. It is possible that the “two” homesteads refers to the main house and the ancillary house. The 1854 Berks County Atlas shows a J. Keim as the resident of the home and the 1862 Berks County Atlas shows a Jacob Keim as the owner. By the late nineteenth century, the property contained 320 acres mostly in Pike Township. As late as 1913, there were 100 acres of virgin forest on the property. At some point, one of the wills that originated at the Keim property stated that the walnut trees were never to be cut down. If they were, the property was to be sold. The property remained in the Keim family until 1911 when the last Keim descendant departed. Mahlon Boyer purchased the farm in 1913, erected a modern sawmill, and cut down the wooded acres. By 1955, the property was owned by Charles Boyer and used as a rental property. The Keim property was placed on the National Register of Historic Places on May 1, 1974. 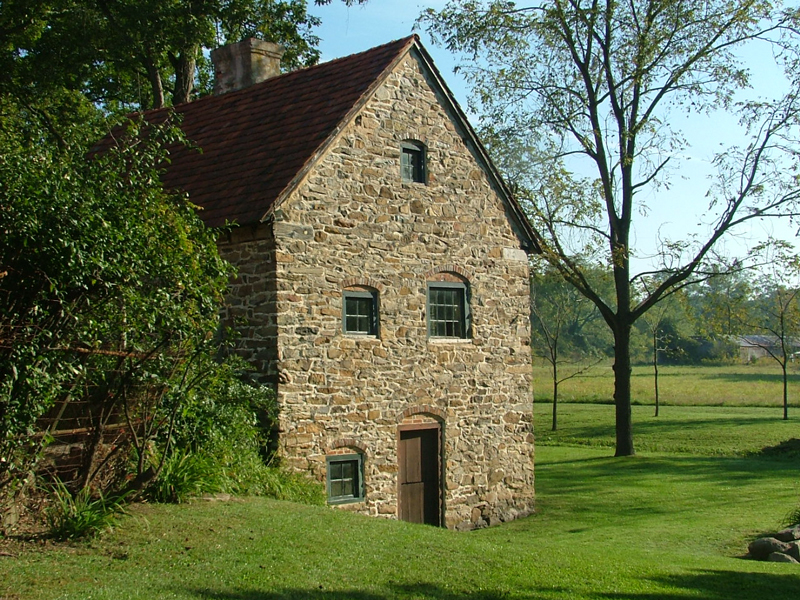 In 1978, the Historic Preservation Trust of Berks County acquired the farmstead as a gift from Mr. and Mrs. M. Richard Boyer. The Keim Farmstead is open every day by advance appointment only. Please contact the Trust office at least 14 days in advance of your trip to make an appointment. Whenever possible, please supply 2 alternate appointment dates. The Keim Farmstead is located on Boyer Road in Pike Township, Berks County, PA.
From Rt. 12 (Pricetown Road), take Rt. 73 East to Bertolet Mill Road. Turn left on Bertolet Mill Road. Proceed to intersection at Hoch Road. Turn left onto Hoch Road. Proceed to Boyer Road. Turn right onto Boyer Road and proceed approximately 500 yards. Keim Farmstead is on the right-hand side of the road. The Jacob Keim Homestead was designated a National Historic Landmark on January 11, 2017. Below is the nomination application. The accompanying maps and photos will be added soon. Interested in learning more about the Jacob Keim Farmstead and the Historic Preservation Trust of Berks County? Search records, pictures, images, architectural drawings and more in our Online Archive.